We’d love your help. Let us know what’s wrong with this preview of John Brown by W.E.B. Du Bois. This title is among my favorite biographies of all time. The profs teaching the class I took in college featured John Brown as a small figure in American contemporary history and dismissed him fairly quickly. He meant well, but was not stable, they said; in the end, he took extreme, hopeless measures that were destined for doom. He remained a hero to Black families (they admitted), South and North alike, as the first Caucasian man who was willing to die for the rights of Black people. Whereas ma This title is among my favorite biographies of all time. The profs teaching the class I took in college featured John Brown as a small figure in American contemporary history and dismissed him fairly quickly. He meant well, but was not stable, they said; in the end, he took extreme, hopeless measures that were destined for doom. He remained a hero to Black families (they admitted), South and North alike, as the first Caucasian man who was willing to die for the rights of Black people. Whereas many White folks (those with enough money for a fireplace and a portrait to go over it) featured a family ancestor or a painting of George Washington, Black homes often had a picture of John Brown. The problem with the education I received is that no African-American scholars were included in this very central, pivotal part of the prelude to the American Civil War. Few would doubt the credentials of W.E.B. Du Bois, whose urgent and compelling defense of Brown as a selfless but sane man with a perfectly good plan that went wrong due to a couple of the people in key positions of responsibility for the taking of Harper's Ferry. The narrative Du Bois presents here is a compelling one, and it makes much more sense than the version peddled to most history students. It's tempting to st0p here, but I think I need to give you a couple of instances that may draw you in--if you like history, care about the rights of Black people in the USA--because the oppression that started here is still not over. if you are interested in the Civil War or Brown in particular, you have to read this book. Tidbits that do not spoil, then: Harriet Tubman planned to be there with him. She became seriously ill and was confined to bed; otherwise, she meant to fight alongside him. White writers have all assumed that his escape route was impossible. They have the WRONG escape route. Brown did not share the working escape route with Quakers or other Caucasians apart from his family; DuBois tells us the actual route, which he argues could well have worked. The Underground Railroad was run almost entirely by Black people, some of them wealthy, in the Northern US. DuBois points out that free Blacks owned over a million dollars worth of property, free and clear. Forget the mental image you may have grown up with in which the whole network is run by Quakers; though the Caucasian abolitionists were more Quakers (Friends) than not, they were a minority. It galls me that even in this, the history of the first liberation struggle of African-Americans, Black folk are excluded from conventional U.S. textbooks. It was this large body of free Blacks who provided the funding for Brown. He would have had more, if he had not become ill, and the loss of momentum removed most of his Canadian backers. Indeed, DuBois states that Brown most likely went to Harper's Ferry physically ill and "racked with pain", that he was very gaunt due to illness and poverty, but felt that to wait longer would be to lose his support and those he had gathered (a small group) for the initial attack. My only knowledge of John Brown prior to reading several books on him in the last year was that he had been a overzealous and unrealistic idealist that led a raid on Harper's Ferry to try to spark a slave rebellion. Reading more details about his planning and overall plan show the historical inaccuracies in the standard narrative of both John Brown and of the abolitionist movement, specifically that the there was a wide range of opinion (from the pacifist educationalism of Garrison to the milita My only knowledge of John Brown prior to reading several books on him in the last year was that he had been a overzealous and unrealistic idealist that led a raid on Harper's Ferry to try to spark a slave rebellion. Reading more details about his planning and overall plan show the historical inaccuracies in the standard narrative of both John Brown and of the abolitionist movement, specifically that the there was a wide range of opinion (from the pacifist educationalism of Garrison to the militant direct action of Harriet Tubman and Sojourner Truth and Brown's insurrectionalist scheme). The other main lesson of this book for me was that the reactions of John Brown's contemporaries within the abolitionist movement varied as widely as the contemporaries of the Weather Underground or the Black Liberation Army one hundred years later in the antiwar and Black liberation movements. Also, the tone of W.E.B. DuBois in the book was that of skeptical and sometimes archly ironic appreciation and respect. The raid on Harper's Ferry was to be an opening of a strategic campaign of guerilla warfare where weapons would be taken and stockpiled in the hopes of outfitting guerilla teams in the alleghany mountains which would in turn conduct raids on plantations to rescue, recruit, and arm willing slaves to fight slavery directly. This would supplement the underground railroad which had been heroically carrying out clandestine transportation of escaping slaves for decades. Today happens to be the 158th anniversary of John Brown's ill-fated raid on Harper's Ferry. I was there just a month ago, and took that as a motive to read this bio by Du Bois. Du Bois is an excellent, literary writer, and it was a great book. It was published in 1909, commemorating the 50th anniversary of the raid, and offering an African-American perspective. I have not read any more recent or more scholarly bios, but this relied primarily on letters written by Brown or others who knew him, so Today happens to be the 158th anniversary of John Brown's ill-fated raid on Harper's Ferry. I was there just a month ago, and took that as a motive to read this bio by Du Bois. Du Bois is an excellent, literary writer, and it was a great book. It was published in 1909, commemorating the 50th anniversary of the raid, and offering an African-American perspective. I have not read any more recent or more scholarly bios, but this relied primarily on letters written by Brown or others who knew him, so it at least offers an important personal perspective. Brown moved around a lot as a youth and adult, but he often lived in Richfield or Hudson, Ohio. That is very near where I grew up, and some of my family now live in Richfield. I have been to one of the houses (now an antique store) where he once lived. Thinking back on his time there, when he was later living in Massachusetts, he wrote (p. 37): "I can look back to our log cabin at the centre of Richfield with a supper of porridge and johnny cake as a place of far more interest to me than the Massasoit of Springfield." At age 12 Brown drove a herd of cattle hundreds of miles through wooded wilderness, and was given hospitality along the way by a pleasant and friendly man (p. 10). While staying there Brown befriended the man's young slave boy, who was about the same age as him. He felt the slave boy was "fully if not more than his equal." But the host family regularly berated the slave boy, and Brown witnessed them beat him mercilessly with a shovel. Slaves had no human father to look after them, and Brown wondered "Is God their Father?" Then he determined to do something for slaves. Brown was as close as there is to a modern-day Old Testament prophet. Certain in theology; humble in demeanor. "I have never made any business arrangement which would prevent me at any time answering the call of the Lord....I have permitted nothing to be in the way of my duty, neither my wife, my children, nor worldly goods. Whenever the occasion offered, I was ready. The hour is very near at hand, and all who are willing to act should be ready" (p. 111). Much of his adult life was preparation for his raid. He had read all the books on insurrectionary warfare, and studied the guerrilla warfare of the Spanish chieftains against the Romans, and the Circassians against the Russians (p. 127). He lived and fought in Kansas, preventing it from becoming a slave-state. Many of his allies there were racists who fought slavery there b/c they didn't want ANY blacks in the state! So Brown was a pragmatist. Brown renounced non-violence as a form of cowardice (p. 88): "It seemed to Brown nothing less than a crime for men to lie down and be kicked by ruffians." In response to terrorism by pro-slavery forces he oversaw the capture of 5 of the worst of them and "raised his hand and at the signal the victims were hacked to death with broadswords" (p. 90 & 79). Brown said (p. 91), "God is my witness, we were justified under the circumstances....I believe I was doing God's service....He has used me as an instrument to kill men, and if I live, I think he will use me as an instrument to kill a good many more." "To recognize an evil and not strike it was to John Brown sinful. 'Talk, talk, talk,' he said derisively" (p. 204). His plan for Harper's Ferry was to create a defensible independent community for blacks in the Appalachian mountains. It was well-thought-out, with a constitution and officers. But his main problem was convincing people to take the risk. One of his great personal friends and supporters was Frederick Douglass--but Douglass would not endorse the raid b/c he saw no way for it to succeed (pp. 177ff). Of course, he was right, and the raid lasted less than 24 hours. Brown's legacy stemmed more from his death than from his plan. Douglass claimed (p. 211): "John Brown began the war that ended American slavery, and made this a free republic." p. 152: Brown recruited freed and escaped slaves in Canada to fight with him. "The question came up as to what flag should be used; [they] said they would never think of fighting under the hated 'Stars and Stripes'....But Brown said the old flag was good enough for him; under it freedom had been won from the tyrants of the Old World for white men; now he intended to make it do duty for the black men. He declared emphatically that he would not give up the Stars and Stripes. That settled the question." This reminded me of present-day supporters of the Confederate battle flag who argue that slavery long existed under the US flag. This is the definitive work on Brown. If you had to read only one book on the subject, this would be it. Du Bois manages to do what no other biographer has done, and I've read about a dozen books on Brown. Du Buois manages to place the man in context. After all, there are a whole lot of John Browns out there, and it takes some doing to explain why this one is different. He starts back in the Revolutionary War, with Brown's parents, and follows him through his life and the deforming effect that 19 This is the definitive work on Brown. If you had to read only one book on the subject, this would be it. Du Bois manages to do what no other biographer has done, and I've read about a dozen books on Brown. Du Buois manages to place the man in context. After all, there are a whole lot of John Browns out there, and it takes some doing to explain why this one is different. He starts back in the Revolutionary War, with Brown's parents, and follows him through his life and the deforming effect that 19th century American history had on him. Remember that Brown was born in 1800, so the War of 1812 happened when he was 12. 1816, the Year Without a Summer, hit when he was 16. The Panic of 1837 happened when he was 37. The labor unrests of the 1850s hit when he was in his 50s, and as it happened that was the final straw. Turns out you can only have your entire life destroyed so many times. In a world without slavery, Brown would have been an farmer-businessman of great wealth and power, and we would probably remember him as an early figure in the labor movement. But the world came along and took everything away from him, again and again, until only abolitionism was left. So the question, "Was John Brown crazy?" has been answered. He probably wasn't as sane at the end as when he started, but on the whole, he was a sane man in a crazy world. Du Bois is the single most powerful writer I've come across since....Shakespeare, really. He's really that good. The words just leap out at you. The chapter on the Swamp of the Swan is one of the best-written things I've ever read, as is the last chapter, where he takes white supremacy apart to itty-bitty pieces. I mean, it's early 2017 and I live in America. I've read approximately one thousand takedowns of white supremacy in the last year. Du Bois's is the best. That's saying something. This early work by W.E.B. Du Bois shows the author transitioning from an academic historian to a political writer. Ostensibly a biography, this is more revolutionary propaganda than historical document. However one chooses to categorize it, it is a worthwhile and entertaining work. Du Bois is not here trying to humanize Brown in response to the demonization that most American historians had to that point, and to a degree still, treated Brown. Rather, Du Bois is using fire and brimstone to fight This early work by W.E.B. Du Bois shows the author transitioning from an academic historian to a political writer. Ostensibly a biography, this is more revolutionary propaganda than historical document. However one chooses to categorize it, it is a worthwhile and entertaining work. Du Bois is not here trying to humanize Brown in response to the demonization that most American historians had to that point, and to a degree still, treated Brown. Rather, Du Bois is using fire and brimstone to fight fire and brimstone. His Brown is neither demon nor man but an angelic incarnation of avenging decency. Du Bois wants to make Brown not just morally great, but strategically brilliant as well. Some of the least convincing parts of the book attempt to convince the reader that were it not for bad luck, the raid on Harper's Ferry might well have been a success. The fact is that most every abolitionist leader of the day, particularly the African-American ones, with the notable exception of Harriet Tubman, considered Brown's attack on Harper's Ferry to be a suicide mission. Du Bois's attempts to retroactively prove them all wrong seem hollow. The authorial claim that does ring more true is Du Bois's assertion that Brown's raid was a decisive precursor to the Civil War. Without the terror Brown inflicted in Southern hearts, the slave states may have at least waited to succeed. 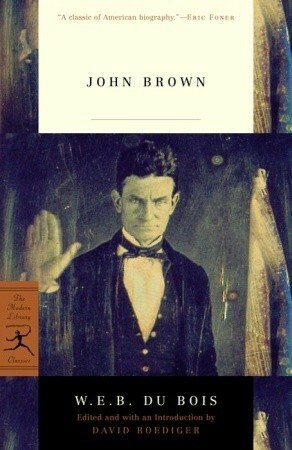 Excellent biography of John Brown. History tends to paint him as some kind of murderous rebel, but Du Bois correctly shows he was a patriot hoping to fight a guerilla war to free America's slaves. "John Brown taught us that the cheapest price to pay for liberty is what it costs today" (p. 237). John Brown's method of principled violence against entrenched systems of violent injustice must be taken seriously in dialogue with the non-violent methods of the Quakers, Gandhi and King. Du Bois brings beautiful writing and careful analysis to this pivotal episode in US history. And his concluding essay turning social Darwinism on its head is brilliant. "These were the men - idealists, dreamers, so "John Brown taught us that the cheapest price to pay for liberty is what it costs today" (p. 237). "These were the men - idealists, dreamers, soldiers and avengers, varying from the silent and thoughtful to the quick and impulsive; from the cold and biter to the ignorant and faithful. They believed in God, in spirits, in fate, in liberty. To them the world was a wild, young unregulated thing, and they were born to set it right. It was a veritable band of crusaders, and while it had much of weakness and extravagance, it had nothing nasty or unclean" (p. 171). Starts slow, but once Kansas starts bleeding, things start picking up. A judicious but passionate investigation of one of the most important men in the most important periods in American history. W.E.B. DuBois' voice is also always a pleasure to read, and his theoretical considerations at the end have profound resonance in our day as well. For their second gathering, the leaders of the anti-racist Niagara Movement chose to convene on the campus of Storer College in Harper's Ferry, West Virginia in 1906. Two days after the conference attendees marched barefoot to the "hallowed ground" of John Brown's 1859 raid to free enslaved Americans, W.E.B. Du Bois read his famous "Address to the Country." The choice of location for the important conference that would help set the stage for the founding of the NAACP, the somber promenade to vis For their second gathering, the leaders of the anti-racist Niagara Movement chose to convene on the campus of Storer College in Harper's Ferry, West Virginia in 1906. Two days after the conference attendees marched barefoot to the "hallowed ground" of John Brown's 1859 raid to free enslaved Americans, W.E.B. Du Bois read his famous "Address to the Country." The choice of location for the important conference that would help set the stage for the founding of the NAACP, the somber promenade to visit the historic landmark of Brown's rebellion, and Du Bois's fiery address, all resonate with the urgency of Du Bois's deep reflections on the life and legacy of the white abolitionist, John Brown. In the over 150 years since Brown's raid, the name John Brown continues to haunt the American imaginary. As a child, I remember very well my first visit to Harper's Ferry. On the one hand, Brown is presented in the National Park Services official exhibitions as a visionary hero whose religious convictions led him to organize a battalion of vigilantes determined to sacrifice their own lives for liberating enslaved men and women across the South. On the other hand, Brown is portrayed as a fanatic whose extremism promoted violence, murder, and war. The latter view informed John Steuart Curry's famous "Tragic Prelude" painting on the walls of the State Capital building of Kansas. In Curry's mural, Brown bears the visage of a crazed lunatic, driven by religious extremism. For Curry, like many of his generation, it was absolutism on both sides that resulted in the Civil War between the North and the South. Written between 1904 and completed three years after the Niagara Movement conference in Harper's Ferry, Du Bois's biography of John Brown constructs a representation in which Brown is neither mythic nor lunatic. Reading Du Bois's book, I kept thinking about the stark difference between his account of Brown's life and the mural by Curry. Where the latter attempts to fix an analysis in a static image with Brown towering over a perfectly balanced the human and natural forces of North and South on either side, Du Bois is less interested in a singular image than in the long road of how one organizes a life committed to liberation. Drawing on his powers as a sociologist, Du Bois extensively consults the available written accounts of witnesses as well as Brown's own correspondences. What emerges is not merely a demythified John Brown, but a singular historical figure situated in an expansive landscape of actors, events, forms of political organization, and competing ideas around strategy and tactics. In other words, Du Bois gives us an exhaustive account of the machinery behind the image. We learn of the extensive networks of abolitionist societies that spanned from New England to the Kansan Territories and deep into Canada. We learn of the volatile coalition between slavery abolitionists, those who saw slaves as an economic threat to White workers, and those who opposed slavery purely out of White Supremacist impulses. We also learn of the role of Quakers in hosting Brown's military training camp where the young men who would lead the assault on Harper's Ferry drilled with arms, studied, and practiced their Christian faith. Du Bois's sociology, however, does not limit him to providing only descriptive account. Compelled by his own growing hunger for mass political action, Du Bois takes the time to attend to those like Frederick Douglass and others who critiqued Brown's plan for the Harper's Ferry assault on the basis of tactic. In his account of how the actual raid unfolded, Du Bois offers keen insights into the failings of the interventions -- all the while insisting that the plan had the potential to succeed. The lesson we take from John Brown is not a warning against fanaticism per se. Citing in detail the transcripts from the court proceedings that sentenced Brown and his surviving fighters to the gallows, Du Bois clearly shows that the abolitionist aimed to free slaves as a strategy for breaking the slavery system. War, murder, and sedition were not in any way his purpose. From his experience in Kansas fighting against pro-slavery ruffians, Brown had no delusions about the reaction from those with the most to lose from the defeat of the slavery system. Rather, as Du Bois takes pains to demonstrate, there is something absolutely rational about Brown's strategy and his means, long-cultivated in the battlefields of Kansas and in the dialogue with those most connected to the anti-slavery movement. It is true that there are many accounts of John Brown life. In either biography, history, or comic novel, he remains a crucial figure in how we grapple with the contradictions of American promise and American injustice. And yet Du Bois's book offers something uniquely priceless in terms of reading a biography of a white abolitionist who took up arms written by one of the most significant architects of the freedom struggle. What does Du Bois think about Brown, the white Northerner, acting upon his convictions for the liberation of the oppressed? What does the historical account of John Brown suggest for the foundation of solidarity between the races in the struggle against oppression and exploitation? How does Du Bois make sense of Brown's tactical use of armed rebellion in the fight against a social-economic system? What is Du Bois's analysis of the larger abolitionist movement that could claim such diverse figures and strategies from the underground railroad to those advocating extraction? And since Du Bois is writing at precisely the same moment the Niagara Movement takes up its debate against the conciliatory tendency of Booker T. Washington, Du Bois's John Brown becomes as much a radical voice for 1906 as a figure of the mid-1800s. In many respects, the above questions linger even today for anyone committed to the struggle for freedom. But at a time when identity -- particularly Whiteness -- becomes a growing alibi for indifference and lethal resentment, Du Bois's John Brown provides a challenge for how we might think about the agency of solidarity; one in which the old problem of fanaticism succumbs to the urgent question of what it means to take militant action when the severity of the risks fall unevenly on people of color as on Whites, on the poor as on the propertied, on the enslaved as on the free, and on the citizen as on the noncitizen. According to Du Bois, the reality that Blacks would suffer more than Brown himself from taking armed action served as the basis for Frederick Douglass's decision to decline Brown's call to join the raid on Harper's Ferry. Even in the final hour, standing in a quarry facing the entreaties of Brown and his plans for a sustained attack on slavery, Douglass would not follow his old friend into battle. Interestingly, as Du Bois points out, whatever reservations Douglass felt were not shared by Harriet Tubman. In fact, had it not be for a debilitating illness, Tubman would have been at Harper's Ferry, and the would have been the only woman present (and permitted by Captain Brown). In the immediate wake of the raid, Douglass watched and listened as shockwaves rippled through the fabric of American discourse and consciousness. In time, Douglass would come to see Brown's assault as not the ending of slavery that Brown may have intended but as the beginning of that ending. Furthermore, Douglass would some come to believe that only revolution would shake America free from the system of slavery. As for me, a reader of Du Bois's John Brown, it is not so much Frederick Douglass or even John Brown that haunts me after reading the last page. Rather, and here I think Du Bois too felt so inclined, I cannot shake from my thoughts Du Bois's depiction of Shields Green. An illiterate former slave, Green listens to Douglass's counsel on the eve of the raid not to partake in Brown's foolish suicide mission. Yet after hearing the entreaties of the leader of the freedom struggle, Green responded, "I'll go with the old man," and thus elected to go into battle and to his death. As Du Bois repeats continually throughout the book, "The cost of liberty is less than the price of repression." These words, these terrible words, could so easily be dismissed as fanatical. But what is fanaticism to those oppressed by centuries of suffering in a society whose wealth and elites stand erect on the toil and dehumanization of the working masses? This is a very complete, very through book on John Brown. It covers his entire life and just what kind of person he was and how this led to the assault on Harper's Ferry. The introduction talks about slave revolts, the revolution in Haiti, a race riot in Atlanta in 1906 and other similar things. The preface establishes a chronology for Brown's life and how, when he was quite young, he saw a slave abused. As an adult his financial life was damaged by various crashes and 'panics' in the world of mo This is a very complete, very through book on John Brown. It covers his entire life and just what kind of person he was and how this led to the assault on Harper's Ferry. The introduction talks about slave revolts, the revolution in Haiti, a race riot in Atlanta in 1906 and other similar things. The preface establishes a chronology for Brown's life and how, when he was quite young, he saw a slave abused. One of the most fascinating parts of the book is about the fight between Missouri and Kansas. The people in Missouri wanted to make Kansas a slave state and they basically waged war against Kansas with actual armed invasions of that state. Eventually John Brown came up with the idea of freeing slave and getting them into nearby mountains (along with weapons and support) and having them wage a guerrilla warfare to free more slaves. The problem was that John Brown did not have an actual army behind him. He did recruit some men but nowhere near what he actually needed. He traveled all over the country to get money so he could raise his 'army' but even that proved extremely difficult. The battle itself is covered in detail. The trial is also covered along with the judge's refusal to give Brown's defense enough time to prepare their case. One of the first observations one will make about this is its lack of original research and reliance on two-or-three biographers. But it then becomes apparent that this is in fact an extremely ambitious meta-analysis of the historiography and, especially, an attempt to radically re-contextualize the figure of John Brown. In both respects it is interesting and successful. This book, in its original publication by George W. Jacobs & Company, was one of a series of biographies of at least twenty-three famous Americans of the nineteenth century brought out by this publisher under its imprint American Crisis Biographies. Other biographies from this same set currently listed on GR are Frederick Douglas by Booker T. Washington and William Lloyd Garrison by Lindsay Swift. Du Bois works the hell out of primary source documents to tell John Brown’s story—with great humanity, but also the flourishing that should accompany as grandiose a personality as Brown. And I loved how, in the end, Du Bois positioned Brown’s legacy within the context of his own time, and the concerns of Marxism. I knew the story of John Brown, but not the details of the man himself. A fantastic, educational read that is as relevant today as it was when it was first published. A man devoted to others, a true American hero. DuBois’ writing is timeless, and I’m very glad I decided to read this. I've always been intrested in John Brown and the Raid on Harper's Ferry. I have ancestors who were involved with Brown (though not the raid) and my parents are buried across from Edwin Coppoc who was executed for taking part in it. My gguncle brought Coppoc's body back to Salem, Ohio. I've also not read a lot of W E B DuBois, and as a trained historian I should. So I took this opportunity to catch up a bit. From all reports, this is not one of DuBois's best books. He wrote it over a long period I've always been intrested in John Brown and the Raid on Harper's Ferry. I have ancestors who were involved with Brown (though not the raid) and my parents are buried across from Edwin Coppoc who was executed for taking part in it. My gguncle brought Coppoc's body back to Salem, Ohio. I've also not read a lot of W E B DuBois, and as a trained historian I should. So I took this opportunity to catch up a bit. From all reports, this is not one of DuBois's best books. He wrote it over a long period of time and it is not typical of his work apparently That's OK. I see the flaws, including his emotional attachment to Brown, but still it's a good read. Being influenced by Raymond Massey as John Brown in the movies, I had no idea that Brown has been so "respectable" and well-to-do (except during Panics) most of is life and that he was certainly not crazy. Obsessed with ending slavery--yes. (Frederick Douglass declared that when Brown stayed with him a few weeks he became a total bore unable to talk about anything else but freeing slaves). But crazy? No. I also found it surprising that almost Mansonlike (sorry!) he claimed never to have killed anyone; only taught others how to do it. Well, we'll let that one. I need to read more on Brown, but he sure played is part in Kansas. Brown's bio is full of surprises, the bigget that so many people, many of them prominent such as Frederick Douglass and Gerrit Smith knew all about the plans for raid (Smith financialy supported Brown to the tune of $1000 and Douglass thought the plan was pure folly), but that nothing happened to any of these people afterwards. Today our Homeland Security thugs would have hauled everyone to the slammer. I was also surprised to read that Brown was apparently a very kind man who loved children and animals. It's hard to say if the raid could have succeeded if some of Brown's own men hadn't dawddled the day away (and it wasn't crackbrained as we sometmies hear), but it certainly set the stage for the War Between the States (my favored term for the Civil War, since civil wars are something a bit different). The last few chapters of the book are riveting and elegant (unfortunatley DuBois sets a rather flowering tone through most of the book) and the last chapter, which Debois added decades later, places John Brown in the context of contemporary movements and politics. This biography has some interesting details about John Brown and his life, but glosses over some of his excesses and is a bit to "preachy." Conflicted with this book. This was the work of which Du Bois was most proud. I'm less impressed. It is dated in its history. It lacks the academic integrity of contemporary historical books. Rarely does he provide footnotes. For Du Bois, it is clear that his attention is drawn to the present and future, rather than the past. In the end, it is a propaganda piece and through the -- at times -- laboring narrative springs Du Boisian wisdom and philosophy. As the book is closing, Du Bois unwraps the Conflicted with this book. This was the work of which Du Bois was most proud. I'm less impressed. It is dated in its history. It lacks the academic integrity of contemporary historical books. Rarely does he provide footnotes. For Du Bois, it is clear that his attention is drawn to the present and future, rather than the past. DuBois wrote critical historical works of our nation, including this one about John Brown, and also carried out more than one crucial task in the Black liberation struggle. John Brown, is present every time a white citizen of the U.S.A. considers what is to be done, and what was not done, to end exploitation based on race. A good history of Brown's life and the period immediately preceding the Civil War. A wonderfully written biography of a fascinating man. Interesting to see the historic figure of John Brown through DuBois's lens. And I thought my Catholic parents were strict. I wouldn't ever want this guy as my dad. Go John Brown!!! In 1868, W.E.B. Du Bois (William Edward Burghardt Du Bois, pronounced 'doo-boyz') was born in Massachusetts. He attended Fisk College in Nashville, then earned his BA in 1890 and his MS in 1891 from Harvard. Du Bois studied at the University of Berlin, then earned his doctorate in history from Harvard in 1894. He taught economics and history at Atlanta University from 1897-1910. The Souls of Black In 1868, W.E.B. Du Bois (William Edward Burghardt Du Bois, pronounced 'doo-boyz') was born in Massachusetts. He attended Fisk College in Nashville, then earned his BA in 1890 and his MS in 1891 from Harvard. Du Bois studied at the University of Berlin, then earned his doctorate in history from Harvard in 1894. He taught economics and history at Atlanta University from 1897-1910. The Souls of Black Folk (1903) made his name, in which he urged black Americans to stand up for their educational and economic rights. Du Bois was a founder of the National Association for the Advancement of Colored People, and edited the NAACP's official journal, "Crisis," from 1910 to 1934. Du Bois turned "Crisis" into the foremost black literary journal. The black nationalist expanded his interests to global concerns, and is called the "father of Pan-Africanism" for organizing international black congresses.